General Rosson fought in ten campaigns with the 3rd Infantry Division in World War II in North Africa, Sicily, Italy, France, and Germany. Wounded in Sicily, he went on to win the nation's second highest decoration for valor, The Distinguished Service Cross, on the "Anzio Beachhead in Italy." He later served on the Army General Staff in the Pentagon, in General Eisenhower's NATO headquarters in Paris, France, and on the staff of the Chairman of the Joint Chiefs of Staff, again in the Pentagon. Troop duty Included command of two Infantry regiments in Germany, and command of the European Airborne Brigade, also in Germany. Commanding General, Provisional Corps (later XXIV Corps), Vietnam, 10 March 1968-31 July 1968. 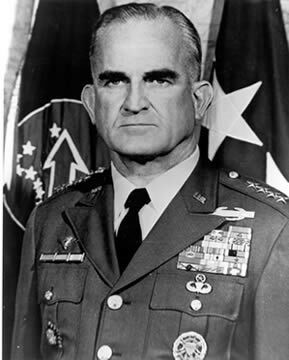 After serving as Commander in Chief of United States Army Forces in the Pacific from 1970 to 1973, General Rosson completed his career in Latin America by serving as Commander in Chief, United States Southern Command from January 1973 to July 1975, with headquarters in the Canal Zone. General Rosson is a graduate of the Army Command and General Staff College, The Army War College, and the National War College. Chopper over Binh Thuan Province, 1968. Following retirement in 1975, General Rosson obtained a Master of Letters degree in international relations from Oxford University in England. In 1984, the General moved from Florida to Roanoke, Virginia. Among his present pursuits are lecturing on national security and international relations, serving as a panelist, conducting professional research and writing for military agencies and journals.